Heat oven to 350°F. Lightly spray 6-cup doughnut pan with cooking spray. In medium bowl, stir together flour, granulated sugar, baking powder, salt, cinnamon and nutmeg with whisk. In 4-cup measuring cup, beat egg, oil, milk, molasses, vanilla and carrot with whisk. Pour wet ingredients into dry ingredients; fold until just combined. Spoon or pipe batter into donut cups, filling about half full. Bake on center oven rack 10 to 12 minutes or until doughnuts are golden around edges and spring back when touched. Remove from oven. Turn doughnuts out onto cooling rack. Repeat with remaining batter. In small bowl, beat cream cheese, milk and powdered sugar with electric mixer on medium speed until smooth. Spread on cooled donuts. 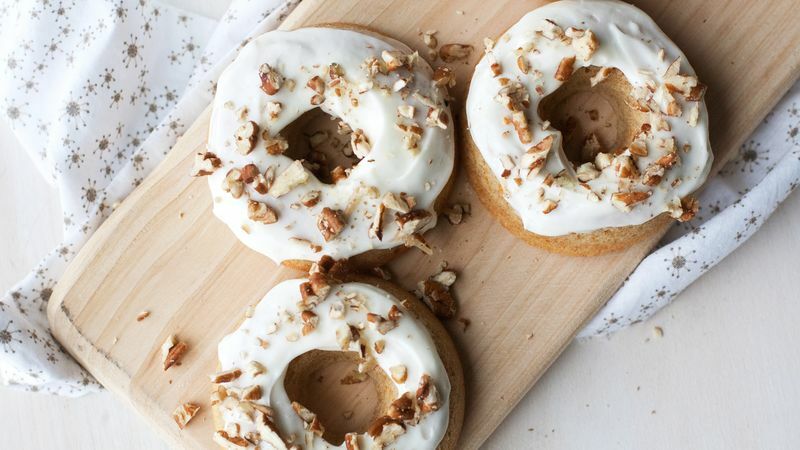 Sprinkle pecans over tops. Using the fine side of the grater will ensure that there won't be any large bits of uncooked carrot in your doughnuts. Using a decorating bag or a zipper-topped plastic bag with one corner snipped off, makes easy and clean work of filling the doughnut cups. Store unfrosted doughnuts for a day or two in an airtight container. Frost them when you’re ready to serve.